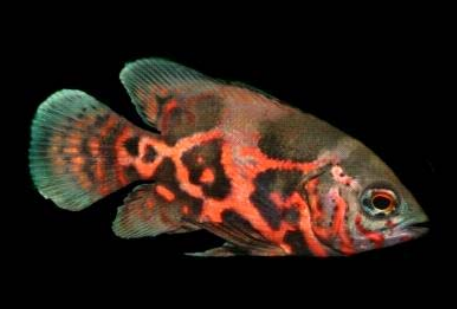 Red Tiger Oscars are one of the largest American Cichlids that we have available in the industry. 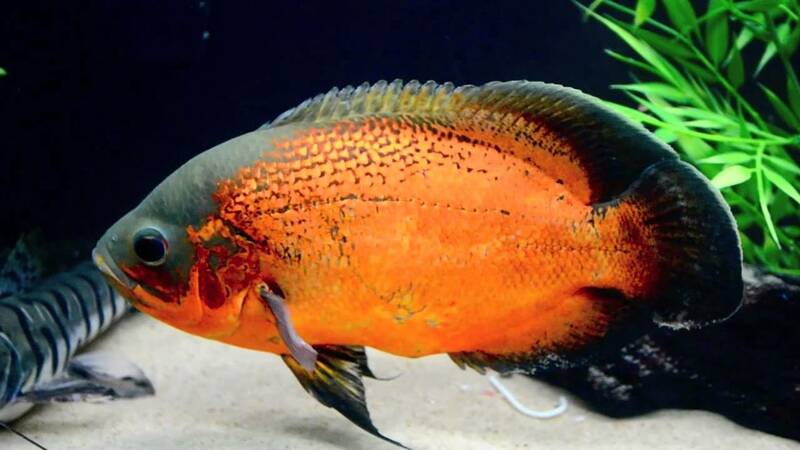 They are a popular cichlid – particularly for younger men I find – for their their beautiful colour, large size and aggressive demeanor. Red Tiger Oscars are a selective breed where a range of colours has been developed from their parent fish – the Peruvian Oscar – that are found in South America’s Amazon River especially in Peru. The different colours include tiger, red and albino forms. More recently long tailed or veil-tailed Oscars have also been developed. Oscars are generally hearty feeders and highly carnivorous, in the wild, an Oscars diet consists primarily of insects and crustaceans.. In the aquarium, they will readily take a range of live and frozen foods including Frozen Bloodworm, Frozen Cichlid Food and Live Crickets, along with dry food such as Cichlid Gold pellets. Oscars will also readily feed on smaller fish, if they can fit it in their mouth they will eat it. It is extremely important, however, not to overfeed your Oscars as this can lead to fatty degeneration of the liver and compromise their health. Oscars are notorious for developing a problem known as ‘Hole in the Head’ in which patches of tissue degenerate around the head leaving large holes in the tissue. It is suggested not to only feed Oscars frozen food but to base its diet on a pellet form, with some frozen treats every few days or so. Oscars are also very sensitive to poor water quality, ensure water changes are sufficient as to keep nitrate levels very low. Oscars are sexually monomorphic and therefore there are no external physical differences between a male and a female. They do get aggressive when breeding and can fight between the pair often resulting in injury or death to either fish. Oscars will dig a ‘nest’ in gravel substrate and deposit their eggs on a flat surface. Eggs hatch after 2 to 3 days and the fry will feed readily on brine shrimp after they begin to swim. 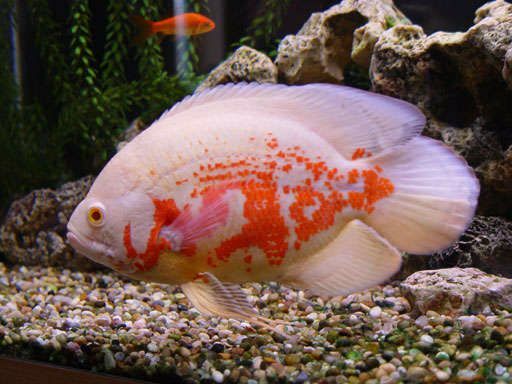 Oscars are compatible with other large fish in an aquarium and oddly, aggressiveness in Oscars decreases as they grow older and bigger and juveniles are more belligerent when compared to a mature fish. Oscars are aggressive, however aquarists often make the mistake of assuming Oscars are as aggressive as specimens like Green Terrors, Red Devils Jack Dempseys, etc… They are not. When housed with these more aggressive fish they generally are on the lower end of the cichlid pecking order. When it comes to housing a pair of Oscars, your best chance of success would be with two females. When young, you may be able to keep two males or a male + female but when sexual maturity sets in, hang on. Two males, no way. There is going to be a war and one of two, if not both, will be killed. A male and female can coexist provided neither detects a weakness in the other and/or both decide to spawn at the same time. We sell Oscars at varying sizes, usually 5cm, 7cm, 10cm or sometimes we get in some at 25cm. Please feel free to call us and we will be happy to assist you getting the right size Oscar for your setup. Longevity: 10 years or more.